Regent Street is one of London’s primary shopping streets, it runs from north of Oxford Street, through its junction with Oxford Street at Oxford Circus to Piccadilly Circus to the south. It has a length of approximately 1 mile and the main shopping section which is south of Oxford Street runs parallel to Bond Street to the west. Regent Street is occupied by the flagship stores of retail chains and smaller upmarket shops. Just south of Oxford Circus on the junction of Regent Street with Great Marlborough Street is the Liberty Store constructed in 1874 and rebuilt in 1910 in the tudor style out of the spars of two ships. It is famous for its window dressing. The well known toy shop Hamleys is located a little further to the south. Slightly to the south of Great Marlborough Street and running parallel with Regent Street is Carnaby Street which was famous in the 1960s for the hippie and mod styles, it is now the home of a number of fashionable boutiques. 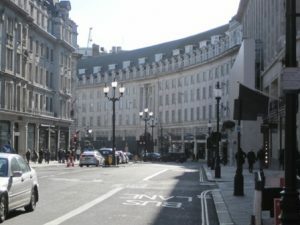 Regent Street was designed by John Nash to connect Regent’s Park in the north to Charing Cross to the south and to separate the less reputable area to the east from the up and coming areas being built to the west. A contemporary commented of the design that is resembled an amphitheatre facing towards Soho. It is interesting to contemplate who was the intended audience and who the players. The Street is named after King George IV who was famous for his lavish spending and debauched lifestyle. A Regent is a monarch who rules when their predecessor remains alive.